Happy Friday Wyrdos! Today we have a new Friday preview from the Cult of the Burning Man. The Burning Man's power can affect more than humanity, and in some cases has affected the wildlife. This preview is of one of those affected creatures. It’s not just humanity that has been touched by the corrupting magic of the Burning Man. Many Earth animals have also been warped by its effects, but none more so than the rhino. This unexplained phenomenon caused a panic in the zoos of San Francisco and London, as the transformed rhinos were granted increased strength and intelligence by the same process that transformed their bellies into searing furnaces. Once a rhino becomes magically corrupted, it seeks out conflict in an effort to cause as much destruction as it can. 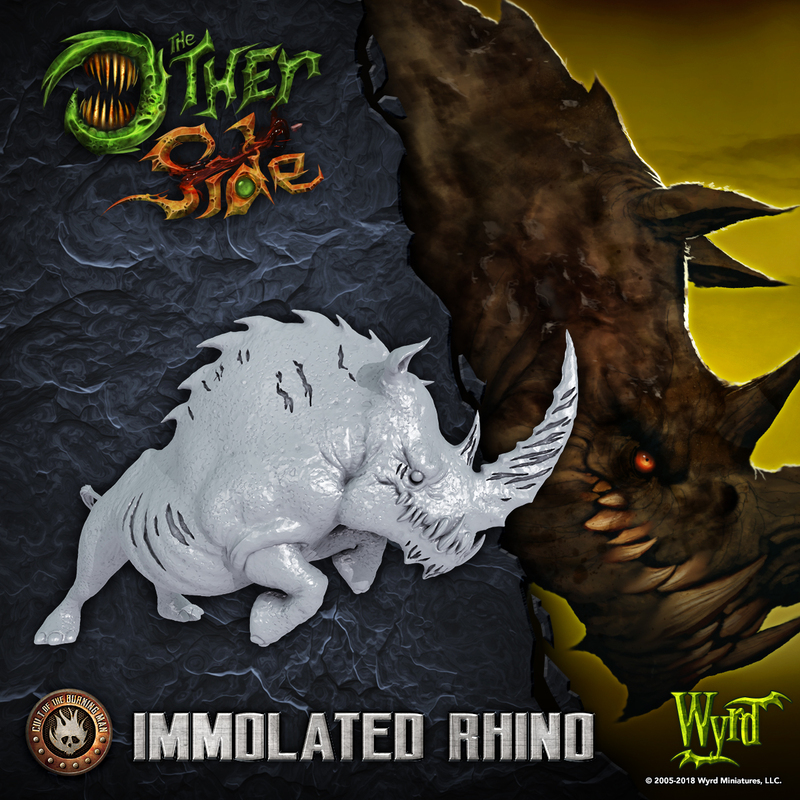 On the table, Immolated Rhinos function best when given the Rush Order and unleashed upon the opponent. Coupled with an ability to pulse out Hits, even a single Rhino is often too potent for the enemy to ignore. Their Consumed by Magic and Incarnation of Flames Abilities make them great distractions, as it will often take a great deal of firepower to permanently end an Immolated Rhino's corrupted life. This guy has me Fired Up for CotB! Way to toot your own horn, guys. The answer to the unasked question; "What's worse than an angry rhino?" Apparently someone forgot to bless the rains in Africa. Also, the Burning Man can apparently turn mammalian herbivores into what looks like carnivorous dinosaurs. Sold. Their background is simple and funny.